The NL241 is a Wi-Fi WLAN (wireless local area network) interface that provides connectivity to your data logger through your existing Wi-Fi network or any available Wi-Fi hotspot. 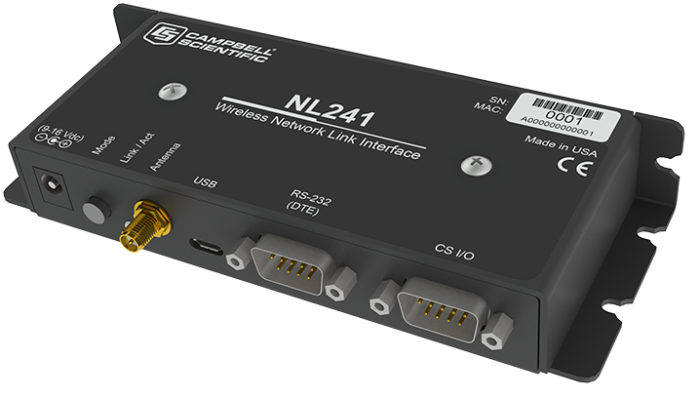 It can either join an existing network or create a network providing a direct link to the data logger or to a cloud data service, like Campbell Scientic’s Konect. The NL241 can also be used as an access point for directly connecting to the data logger from any Wi-Fi enabled device. The NL241 is a wide-operating-temperature and low-power-consumption device, making it ideal for providing Wi-Fi client and access point functionality in demanding and remote applications. The wireless access point feature allows any Wi-Fi device to connect, including your PC, phone, tablet, or even another NL241 or NL240. It can be always on, cycled on and off under program control, or brought up with the touch of a button. Unlike the NL240, the NL241 is a true access point and does not rely on ad hoc networking. This wireless network link interface is configurable to support a number of different types of connections including PakBus, TCP serial server and client, Modbus/TCP gateway, and Wi-Fi to CS I/O port bridging. The NL241 is powered by the data logger when connecting through the CS I/O port. When connected to the RS-232 port, a field cable (pn 14291) is used to connect the NL241 to an appropriate 12 Vdc power supply. ♣The CR300 connects to the NL240 using a 10873 serial cable that is not supplied with the CR300 or the NL240. The CR300-series dataloggers are not compatible with the bridge mode functionality in the NL240 interface. * The data logger OS must be OS 25 or higher for bridge mode applications. ** It is possible to use an NL240 to connect to a mixed-array data logger (e.g., CR10, CR10X, CR23X, 21X, CR7) by using an SC32B between the data logger's CS I/O port and the NL240's RS-232 port. Current NL241 firmware. Requires the Device Configuration Utility and a USB micro cable.